The MSE Equity Total Return Index continued its recent recovery, as it added to the previous week’s substantial hike, with a more modest gain of 0.313 per cent, to close at 8,851.325 points. The Index closed at 8,836.856 on Thursday, meaning that it has lost 1.802 per cent in value over the month of January, as despite a strong end to the month, it failed to fully bounce back from earlier losses. The local equity market was dominated by buying pressure last week, as from the 18 active equities, nine saw increases in value, while only three closed lower. Investor participation was in line with the previous week’s figure of €2.2 million, as a turnover of €2.1 million was generated last week across 179 transactions. One of the drivers of the index performance, was telecommunications company, GO plc. The equity continued its impressive run, as it climbed 1.43 per cent to set a new record high of €4.26. A heavy turnover of €256,209 was generated across 16 transactions. GO had a very positive month as it registered an overall price hike of 7.07 per cent during January. The company announced that its board is scheduled to meet on March 8 to consider and approve the company’s audited financial statements for 2018, and also to consider the declaration of a final dividend to be recommended to the Annual General Meeting. On Thursday, the company also issued a reminder that as indicated in the prospectus in respect of a proposed Initial Public Offering of up to 49 per cent of its shareholding in BMIT Technologies plc, the offer period during which shareholders could apply for BMIT shares was closed. 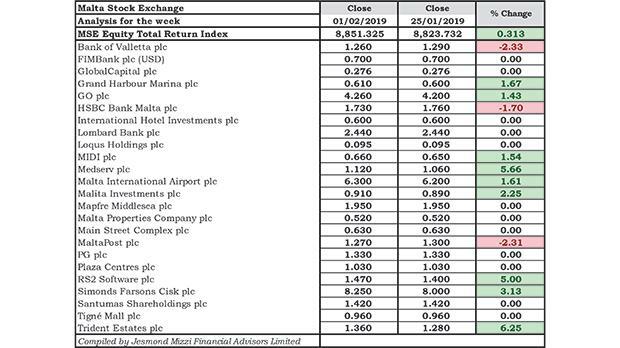 Another significant contributor to the positive performance was the property sector, as no security in the industry posted a loss, while three equities advanced, led by Trident Estates plc. The equity was the best performer of the week with a 6.25 per cent price hike to €1.36, albeit on just a couple of deals of 8,198 shares. MIDI plc followed suit with a 1.54 per cent appreciation, reaching a price of €0.66. A total of 23,180 shares traded across four transactions. In the same sector, Malita Investments plc closed the month at the highest price in almost three years of €0.92, translating to a 4.55 per cent monthly gain. On Friday however, the equity settled at a slightly lower price of €0.91. The 2.25 per cent weekly gain was the result of six transactions of 16,100 shares. Despite recording nine transactions of a combined 153,550 shares, Malta Properties Company plc closed unchanged at €0.52. Similarly, a sole deal of just 3,300 Main Street Complex plc shares had no bearing on the share price of €0.63. The main drag on the index was the banking industry, as the only two active equities in the industry posted losses. Bank of Valletta plc was under selling pressure last week, as it lost 2.33 per cent to a low of €1.26. The equity traded heavily as 280,176 shares changed hands over 42 trades. Similarly, its peer, HSBC Bank Malta plc failed to recover from an early loss of 1.7 per cent, as it traded flat throughout at the price established on Monday, that of €1.73. Traded volume amounted to 14,945 shares across five deals. International Hotel Investments plc also traded five times, as 41,129 shares changed ownership, however, no change was recorded to the closing price of €0.60. Malta International Airport plc continued on a positive path, as it added a further 1.61 per cent to the previous week’s gain, reaching the €6.30 price level. The equity was the most liquid, as an impressive turnover of €492,944 was generated across 29 transactions. MaltaPost plc partially surrendered the gain registered during the previous week, as the share price contracted by 2.31% to €1.27. This was the outcome of three trades of a combined 2,600 shares. Two contrasting performances by Mapfre Middlesea plc cancelled each other out, as the equity ultimately closed unchanged at €1.95. A total of 8,831 shares traded across three transactions. RS2 Software plc was very active during the week as it recorded 27 deals of 217,909 shares. The result was a considerable 5 per cent price increase, to close the week at €1.47. In the food and beverage sector, Simonds Farsons Cisk plc continued its recent recovery, climbing a further 3.13 per cent to €8.25. A total of 30,561 shares traded over seven deals. Medserv plc soared 5.66 per cent over the week, to a price of €1.12. This was the outcome of two trades of a combined 12,650 shares. Similarly, a couple of transactions of 4,000 Grand Harbour Marina plc shares pushed the share price upwards by 1.67 per cent to €0.61. Despite generating a significant turnover of €177,683 over 14 transactions, retail conglomerate PG plc closed unchanged at a price of €1.33. Santumas Shareholdings registered two deals on slim volume last week, none of which had an impact on the share price of €1.42. On Tuesday, Loqus Holdings plc held its Annual General Meeting, during which the audited Financial Statements for the year ended June 30, 2018 were approved. The auditors and directors were also appointed. No trades were recorded during the week. Yields in the local sovereign debt market were predominantly lower, as 11 Malta Government Stocks headed north, while eight gained ground. Activity in the market was relatively low, as turnover amounted to €2.8 million, down from the previous week’s figure of €6.4 million. The 2.2% MGS 2035(I) was the best performer, as it put on a sizeable 2.44 per cent to close at €107. At the other end of the spectrum, the 2.1% MGS 2039(I) erased the previous week’s gain as it lost 0.36 per cent in value to return to the €104 price level. Performances in the corporate debt market were balanced, as gainers amounted to 11, and fallers amounted to 12, over a turnover of €2.1 million. On top of the list of gainers was the 5.1% 6PM Holdings plc Unsecured € 2025, as it advanced 1.49 per cent to close at €102.50. On the other hand, after weeks of inactivity, the 6% Corinthia Finance plc € 2019-2022 sank 3.38 per cent as it traded at par value.